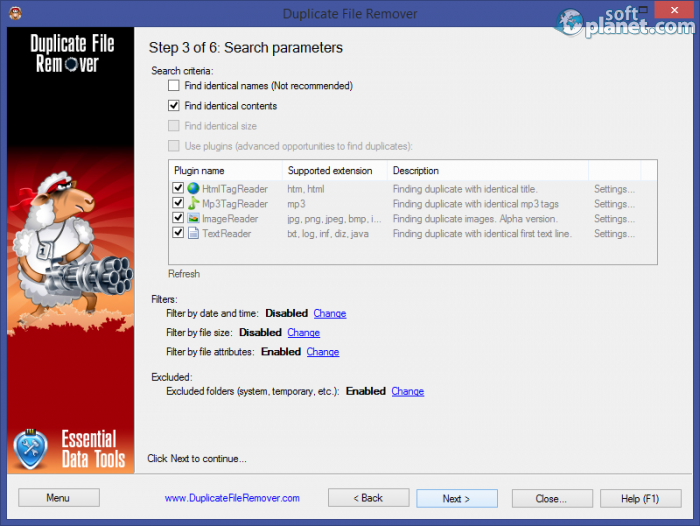 SoftPlanet makes it possible for everyone to get free Duplicate File Remover download directly from our servers. There is no registration needed for downloading. Duplicate File Remover 3.5 is very powerful software, which can localize file duplicates on your PC and take care of them. It is 100% accurate, thanks to its Byte for Byte comparison method. The app is capable of find almost any kind of files like text, binary, music, video and images. Thanks to its wizard-like interface, you will be able to easily handle this task in no time. When it comes to locating duplicate multimedia files, the app analyzes the following tags in order to achieve top accuracy: "Artist", "Album", "Title" and "Comment". Once you have found all of duplicates, they can be delete, hard-linked, moved or just copied. Since the list of duplicate files can be very long, you are able to sort it and find the one you need. In addition, all scan results can be exports as an HTML report. As we have already mentioned, Duplicate File Remover 3.5 offers a wizard-like interface, which includes several simple steps. They will guide you through the entire process of removing all duplicates. It is extremely easy to work with Duplicate File Remover. It doesn't require any computing knowledge at all. As we have probably noticed, the program uses different kinds of comparison criteria for all file types. Duplicate File Remover provides you with search filters like date and time, file size and attributes. However there is another way sort files – by creating an exclusion list. Generally, the app seems to be very stable and does a great job each time. 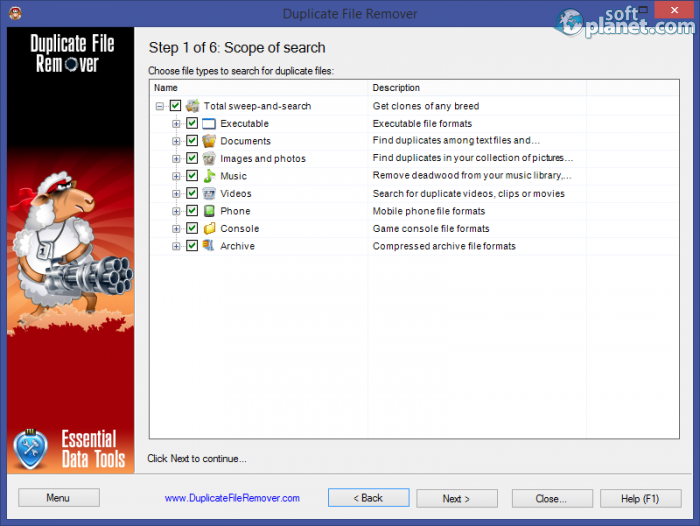 Duplicate File Remover v3 is a very efficient software application, which can help you clean all duplicates on your PC that only waste your free disk space. Please do not hesitate to try it right away. Duplicate File Remover is VIRUS-FREE! Our security scan shows that Duplicate File Remover is clean from viruses. The current version of Duplicate File Remover has been scanned by our system, which contains 46 different anti-virus algorithms. That ensures that Duplicate File Remover 3.5 is 100% safe for your computer.